Good morning! I'm trying to get over a cold and haven't been sleeping well, but I woke up feeling rested this morning, so I decided to see what I could created with Julee's latest Mojo Monday #116 sketch. I also combined this with the latest Crazy 4 Challenges #15, to make a theme card with snowmen or snowflakes. I was excited to use a few new things and was pleased that I could actually use them all together! First I pulled out the oh so adorable Pure Innocence set, Merry Kissmas. It arrived in my mailbox yesterday, and I couldn't wait to ink it up! I stamped and colored the sweet image and finished off the snow hats with Star Dust Stickles. I embossed the sentiment "Merry Kissmas" with gold embossing powder. My patterned paper is from KI Memories -- I stumbled across it at Target the other day -- can you believe it was on clearance and thrown on an end-cap along with other craft goodies?! The ribbon is some felt saddle stitched ribbon that I found on my last trip to Michael's with Stacy. 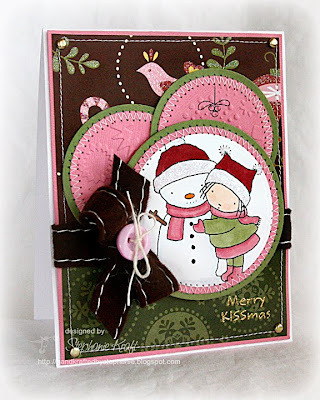 I stamped the mistletoe on one of my pink circular panels, then embossed both with my snowflake embossing folder. A little stitching, gold brads and a buttony bow finish off the rest of my card. I'm going to clean up my craft room and go see about checking some other Christmas items off my list... oh there is SO much to do! I hope you have a wonderful weekend, and as always, thank you SO much for stopping by! Accessories: Circle Nestabilities (Spellbinders), Snowflake embossing folder (Provo Craft), Markers (Copic), Star Dust Stickles (Ranger), Felt ribbon (Michael's), Button (Papertrey Ink), Twine (May Arts), Gold brads, Gold embossing powder, Foam tape, Thread, Sewing machine. This is just darling! I love all the stitching and embossing. Have a fun and productive day! This is just such a wonderful card!! I love the stitching!! Awesome!! Oh. My. Word. This is ADORABLE, Steph!!! Don't you LOVE these stamps? This is so pretty! I love that layout, and loving that pink & brown. One of my favorite color combos. Oh my GOSH, AWESOME sponging around the circles and I love your gorgeous bow!